The other day I got really angry. It came on unexpectedly. One minute I was running on my treadmill listening to a book on tape, the next minute I was choking back some strong, scary emotions. I was angry about something in my past and my first inclination was to ignore it and move on. But that is what my old self would do, not the new enlightened version of me. So, I thought long and hard about my anger. I embraced it and didn't make any judgement about myself or the person who I was angry at. I just felt all my feelings. Suddenly, I fully understood what I was mad about. I felt disrespected and when I thought about it further, I realized that is a trigger for me. When I am loyal and respectful to someone, I expect them to do the same for me. I have always had trouble with loyalty and in the past I have been loyal to a fault. I have been loyal to the man who mows my lawn and kills my trees even after I repeatedly asked him not to use the weed wacker around the trunk of the trees. It took me over 5 years to fire him. I have been loyal to a destitue mother who treated me terribly and took advantage of me because I felt sorry for her and the situation she was in. I have been loyal to someone very close to me and stood by their side during the worst of times even though they were not loyal back. The list goes on and on. Some may call me a sucker or naive, but I am not ashamed of it. I just wish back then when I was angry at those people, I let myself feel it, analyze it and not accept it. Well, better late than never. Now I let myself get angry and I don't let people treat me badly. It was a long time coming, but believe me, it is much healthier and happier way to live. There is nothing like a steaming bowl of Asian noodles garnished with all my favorite toppings to brighten up my day. 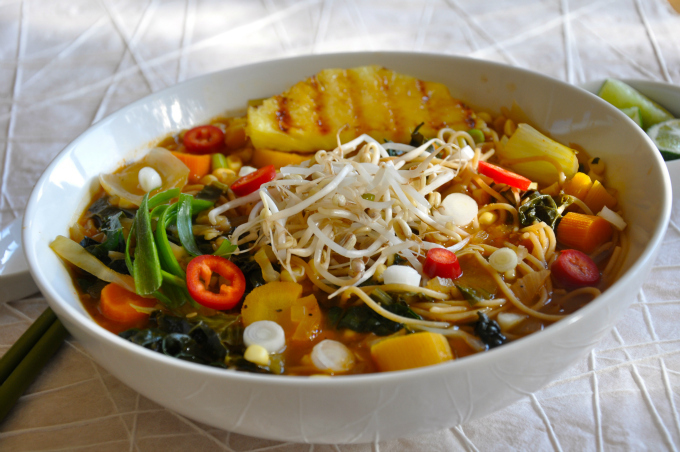 Asian noodle soup is generally categorized as either savory or sweet. This noodle dish has both. Spicy, salty with a very light sweetness and full of delicious flavors. Just for fun, I topped it with some grilled pineapple and it added a tender, sweet deliciousness. 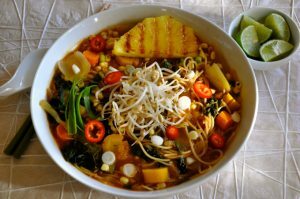 The wonderful thing about this plant-based recipe is that you can use any vegetables and garnishes you like once you make the base and choose your noodle. Hope you enjoy this healthy Asian noodle soup as much as I did. Don't miss any of Ordinary Vegan's free recipes by signing up here. Enjoy this with any vegetables you desire. I like to use whole-wheat thin spaghetti as my noodle but you can use any Asian noodle you like. Cook noodles according to instructions. Rinse and set aside. Use same pot for soup. Grill pineapple slices, if using. Set aside. In a medium bowl, whisk together all base ingredients. In a large pot, heat ¼ cup vegetable broth. Add onions and saute until soft and translucent; adding more vegetable broth if sticking. Add the base ingredients and cook for another two minutes. Add the 32 ounces of vegetable broth and bring to boil. Add carrots, simmer for 10 minutes. Add corn, kale and bok choy and cook for another 5-8 minutes. Taste and add more seasoning if needed. The soy sauce should provide enough sodium. Divide noodles among 4 bowls. Top each bowl with broth and vegetables. Garnish with Fresno chili, green onions, bean sprouts and pineapple slices. Serve with lime wedges for squeezing over noodles. * The easiest and safest way to remove kernels from corn is hold the stem end of the the shucked ear or corn, and rest the tip of the ear on the bottom of a very large bowl. Use a sharp paring knife to cut off kernels, slicing down and let them fall into the bowl.